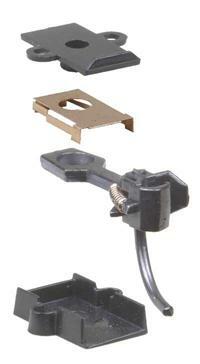 Kadee couplers and accessories are now available at reduced prices! If we don't have it in stock or listed on this web page please ask and we will get it for you! 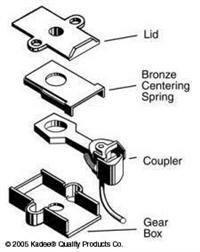 A good reference on use of Kadees is this article on Kadee Coupler Tips. The Kaydee web site is also a good source of information. 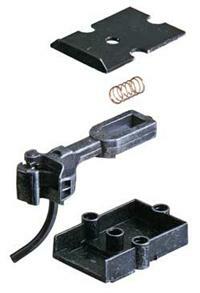 EASY TO ASSEMBLE & USE Includes the No5® Coupler & #58 "Scale" Coupler. 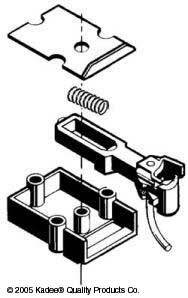 A must have tool for gauging correct coupler height, trip pin, and permanent uncoupler heights for achieving trouble free coupler performance. Also has a built in HO track gauge. "Takes the guess work out" Multi purpose gauge. Four tools in one.1. Provides instant visual reference of proper coupler height.2. 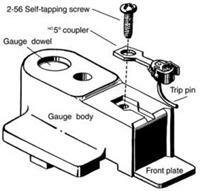 Accurately measures proper trip pin height above rail.3. Built-in track gauge.4. Movable dowel tests Kadee® Magne-Matic® Uncoupler height and registers the needed adjustments. 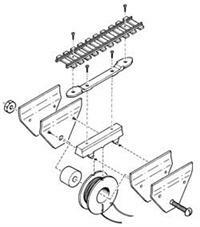 EASY TO ASSEMBLE & USE Includes the #148 "Whisker®" Coupler & #158 "Scale" "Whisker®" Coupler. A must have tool for gauging mounting height, correct coupler height, trip pin, and permanent uncoupler heights for achieving trouble free coupler performance. Also has a built in HO track gauge. "Takes the guess work out"
11-0820 Kadee No 820 Straight Centerset Shank Couplers with Standard Body Mount Gear boxes - 1 scale. NO.5 Mounting Dimensions The NO.5 Kadee Magne-Matic Coupler features a Metal Coupler, #634 Centering Spring, insulated #232 Draft Gear Box and Lid with side and center screw holes for mounting. The NO.5 Coupler may be mounted with supplied #232 draft gear box or with manufactures cast-on coupler pockets. It is not recommended to use a metal coupler directly on a metal surface or in a metal draft gear box to avoid the possible electrical crossover or shorting that may cause damage. 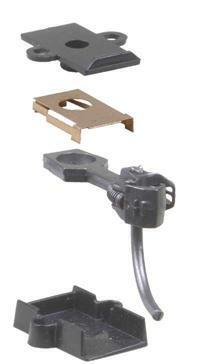 Use the provided insulated draft gear box or use the very strong plastic isolated #28 Coupler which has the same mounting dimensions as the NO.5 Coupler.Two pair per package. Note that the 148 Whisker Coupler will work anywhere a NO.5 coupler will work. 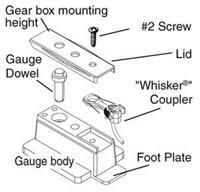 The #148 coupler is the WHISKER® Coupler equivalent to the NO.5® Coupler. 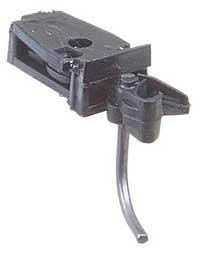 11-0018 Kadee No 18 NEM 362 European Coupler Medium. 2 pair. Quality replacement plug-in Couplers for European equipment. 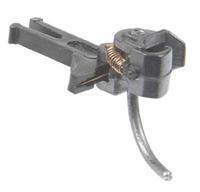 The Kadee Magne-Matic coupler head with the swallow-tail shank to lock in the HO-scale NEM-362 draft gear pocket. Two pair per package. 11-0026 Kadee No 26 Coupler Long (25/64") Centreset Shank. 2 pair. 20-Series Kadee® Magne-Matic® Couplers are designed for either Talgo (bogie) or body mounting. 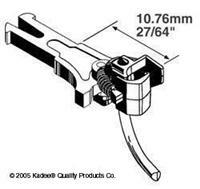 11-0027 Kadee No 27 coupler Medium (9/32") Underset shank. 2 pair. The 20-Series Kadee® Magne-Matic® Couplers are designed for either Talgo (bogie) or body mounting. The #58 Kadee® Magne-Matic® Coupler features a "Scale" Metal Coupler (a smaller head coupler which is more to scale and is patterned after the type 'E" couplers), insulated #232 Draft Gear Box and Lid with side and center screw holes for mounting. The #58 Coupler may be mounted with the supplied #232 draft gear box or with the manufactures cast-on coupler pockets. The coupler will couple and uncouple with other Kadee®HO and HOn3 couplers. The coupler has the same shank and offset as the NO.5®coupler which will allow the modeler to remove the existing NO.5®coupler and replace with the new smaller coupler. The new coupler is made of the same metal construction as the NO.5®for strength and rigidity. It is not recommended to use a metal coupler directly on a metal surface or in a metal draft gear box to avoid the possible electrical crossover or shorting that may cause damage. Use the provided insulated draft gear box or use the very strong plastic isolated #28 Coupler which has the same mounting dimensions as the NO.5®Coupler. The #58 package contains two pair of the new coupler, two pair of the NO.5®centering springs, two pair of the NO.5®gearboxes, and instructions. Please note: that the knuckle spring required for this coupler is the new #625, not the #622 which is used on other couplers. Note: Coupler will work anywhere a #58 Coupler will work. The #158 coupler is the WHISKER Coupler equivalent to the #58 Coupler. 11-0019 Kadee No 19 NEM 362 European Coupler Long. 2 pair. 11-0016 Kadee No 16 European Coupler & Gearbox. 2 pair. Discontinued some in stock. This Coupler is a combination of #6 Coupler and #7 Draft Gear Box. Very useful for European equipment with buffers and some traction applications. Two pair per package. Discontinued replacement is Number 36. 11-0156 Kadee No 156 coupler Whisker scale long (25/64") shank. 2 pair. The #156 "Scale" All Metal Self-Centering WHISKER® Coupler features a "Scale" Metal Coupler (a smaller head coupler which is more to scale and is patterned after the type 'E" couplers) & Metal WHISKER® Centering Spring, insulated Draft Gear Box and Lid. The #156 Coupler may be mounted with the supplied #242 draft gear box, other Kadee® HO-Scale draft gear box shown below or with the manufactures cast-on coupler pockets. 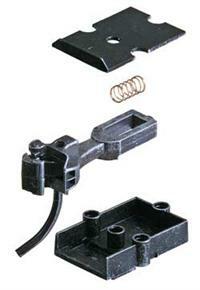 The coupler will couple and uncouple with other Kadee® HO and HOn3 couplers. The coupler has the same shank length as the #26, 36 or 46 coupler which will allow the modeler to remove the existing #26, 36 or 46 coupler and replace with the new smaller coupler. 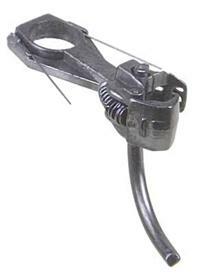 The #156 coupler is made of the same metal as the #46 for strength and rigidity. It is not recommended to use a metal coupler directly on a metal surface or in a metal draft gear box to avoid the possible electrical crossover or shorting that may cause damage. Use the provided insulated draft gear box. The #156 package contains two pair of the new coupler and two pair of the #242 gearboxes, and instructions. 11-0011 Kadee NO.5 Metal Couplers with phosphor bronze metal without draft gearboxes or lids. 20 pair. 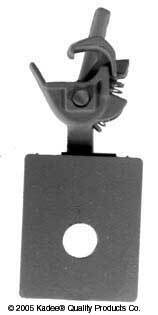 11-0043 Kadee No 43 coupler Short (1/4") Shank Centreset. 2 pair. Discontinued some in stock. The #43 Kadee® Magne-Matic® Coupler features a Metal Coupler, #634 Centering Spring, insulated #232 Draft Gear Box and Lid with side and center screw holes for mounting, which is the same gear box which comes in the NO.5® coupler package. Discontinued replacement is Number 143. The #158 Kadee® Magne-Matic® WHISKER® Coupler features a All Metal Coupler, Metal WHISKER® Centering Spring. The #158 Coupler may be mounted in manufactures cast-on coupler pockets or any of our HO-Scale draft gear boxes (except #233 30-series gear box). 50 pair per package It is not recommended to use a metal coupler directly on a metal surface or in a metal draft gear box to avoid the possible electrical crossover or shorting that may cause damage. 11-0153 Kadee No 153 Whisker scale short shank (1/4"). 2 pair. The #153 "Scale" All Metal Self-Centering WHISKER® Coupler features a "Scale" Metal Coupler (a smaller head coupler which is more to scale and is patterned after the type 'E" couplers) & Metal WHISKER® Centering Spring, insulated Draft Gear Box and Lid. The #153 Coupler may be mounted with the supplied #242 draft gear box, other Kadee® HO-Scale draft gear box shown below or with the manufactures cast-on coupler pockets. The coupler will couple and uncouple with other Kadee® HO and HOn3 couplers. The coupler has the same shank length as the #23, 33 or 43 coupler which will allow the modeler to remove the existing #23, 33 or 43 coupler and replace with the new smaller coupler. 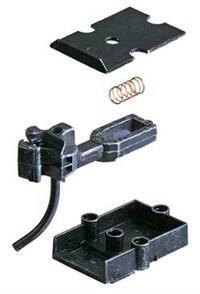 The #153 coupler is made of the same metal as the #43 for strength and rigidity. It is not recommended to use a metal coupler directly on a metal surface or in a metal draft gear box to avoid the possible electrical crossover or shorting that may cause damage. Use the provided insulated draft gear box. The #153 package contains two pair of the new coupler and two pair of the #242 gearboxes, and instructions. 11-0008 Kadee No 8 5/16" Medium Metal Coupler 2 Pair. Discontinued some in stock. 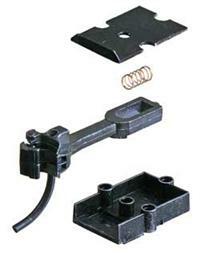 Designed for locomotive pilot mounting and other unusual or difficult mounting situations with limited space. Plastic Draft Gear Box insulates the Coupler. Two pair per package. Discontinued - replaced by Number 38. 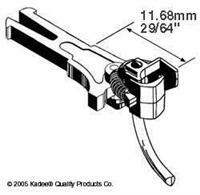 11-0041 Kadee No 41 Coupler Long (25/64") Underset Metal shank. 2 pair. Discontinued some in stock. The #41 Kadee® Magne-Matic® Coupler features a Metal Coupler, #634 Centering Spring, insulated #232 Draft Gear Box and Lid with side and center screw holes for mounting, which is the same gear box which comes in the NO.5® coupler package. Discontinued replacement is Number 141. 11-0024 Kadee No 24 coupler short (1/4") Underset shank. 2 pair. 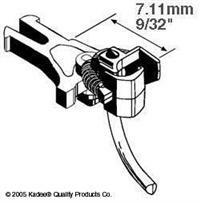 11-0006 Kadee No 6 12/32" Long Metal Kadee Couplers 2 pair -now discontinued some in stock. 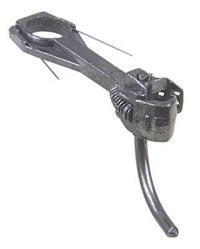 Long shanked coupler designed for locomotive pilot mounting and other unusual or difficult mounting situations with limited space. Plastic Draft Gear Box insulates the Coupler.Two pair per package. 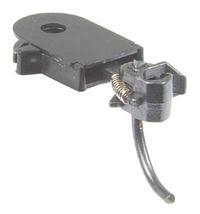 Now discontinued - the replacement coupler is Number 36. 11-0007 Kadee No 7 1/4" short underset metal Kadee Coupler 2 pair. Discontinued some in stock. Underset shanked coupler designed for locomotive pilot mounting and other unusual or difficult mounting situations with limited space. Plastic Draft Gear Box insulates the Coupler. Two pair per package. Discontinued - replaced by Number 34. 11-0017 Kadee No 17 NEM 362 European Coupler Short. 2 pair. 11-0028 Kadee No 28 coupler Medium (19/64") Centreset shank. 2 pair. 11-0036 Kadee No 36 Coupler Long (27/64") Centreset Shank. 2 pair. The 30-Series Kadee® Magne-Matic® Couplers are designed for body mounting either above or below the mounting platform, with or without Draft Gear Box Lid and with Draft Gear Box Lid either on top or bottom. 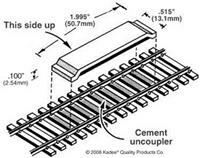 11-0850 Kadee No 850 O Scale Coupler Centreing Springs for 805 couplers. 1 Dozen. 11-0048 Kadee No 43 coupler Short (1/4") Shank Centreset. 2 pair. Discontinued some in stock. 11-0140 Bulk Pack Kadee No 148 Coupler Whisker Standard Medium (9/32") Shank. 50 pair. 11-0242 Bulk Pack of #242 Universal "Black Box" Snap-Together Insulated Gear Boxes & Lids. 10 pair. 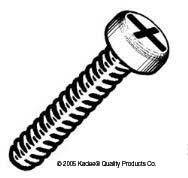 11-0252 Kadee #252 Small Whisker® Snap-together Insulated gear box & lid. 10 pair. 11-0003 Kadee No 148 whisker Ready to use. 11-0010 Kadee NO.5 Metal Couplers with phosphor bronze metal without draft gearboxes or lids. 10 pair. 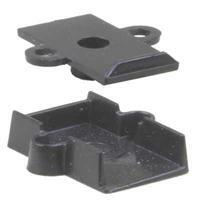 11-0804 Kadee No 804 O Scale Coupler Plastic. 2 pair. 11-0321 Kadee No 321 Delayed "between-the-rails" Uncoupler for Code 100 Track. 11-0308 Kadee No 308 Under Track Uncoupler HOn3, HO, O Scale. Under the track "hidden" installation. 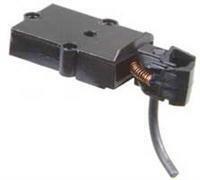 A permanent magnet and steel intensifier plate are included along with instructions. Suitable for a variety of scales from HOn3 to O-Scale. Track not included O-SCALE:Because of the thicker ties and higher rail in O-scale, it will be necessary to use 2 or 3 magnets stacked together and one steel intensifier plate on the bottom of the stack (fig. 6). On some track you may need to trim the bottom of the ties to fit the magnet(s) closer to the rails. 11-0322 Kadee No 322 Delayed "between-the-rails" Uncoupler for Code 80 Track.